Jamsetji Tata established Tata Group in 1868. The logo the Group used before 1998 featured a straight-lined “T” inside a circle frame. The origin of the emblem could be traced back to the Indica car brand. There are over 50 companies associated with Tata Group, each having a different logotype. Many of them are based on the same symbol representing a stylized letter “T.” This symbol is the most important part of the Tata Motors logo, too. It was created in collaboration with one of the world’s most known branding agencies, Wolff Olins. The brand consultancy with offices in London, New York City, and San Francisco was created in 1965 and became a part of the Omnicom Group in 2001. The logo Wolff Olins developed for Tata embodies the innovative spirit of the group, as well as fluidity and adaptability. According to the official explanation, the emblem also symbolizes a fountain of knowledge or a tree of trust. The letter “T” is formed by two lines making a 90-degree angle turn. In addition to the explanation mentioned above, they can also be regarded as stylized depictions of the road. One road is a mirror image of the other, and they turn in opposite directions. The first halves of the roads form the vertical part of the “T,” while the upper halves form something that can be interpreted as the horizontal bar of the “T.” The white road symbol is placed inside an oval shape with the dark blue filler. The Tata Motors logo is in many respects similar to the emblem of its parent company. For instance, it is almost the same regarding the color palette and the typeface. However, the logos are far from being identical. The automaker’s logotype is based on the wordmark. 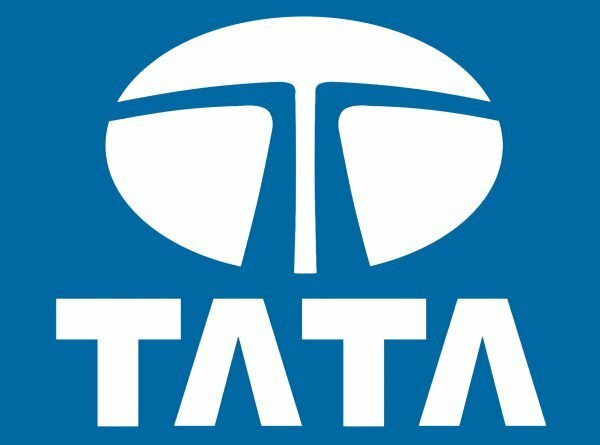 The first word, “Tata,” looks exactly as on the emblem of its parent company, with the distinctive letters “A,” where the horizontal bars have been removed. Next to it, the word “Motors” is also given in a sans serif all-cap type. The first word is bold, while the second one is given in a regular type. All the letters have an identical height but differ in width due to the bold effect. For the same reason, the first word is more pronounced, which seems perfectly natural taking into consideration that this is the name of the whole conglomerate holding company, while “Motors” indicates just a smaller division inside the group. Tata Technologies is one more Tata Group’s division dealing with the automotive industry. In fact, it is an 85%-owned subsidiary of Tata Motors, which specializes in developing cars and offering other services for carmakers. In 2017, the automaker adopted a new corporate brand identity. Basically, the logo itself remained the same but received a new visual interpretation. Now, the wordmark in white is given against the blue background covered with white dots. Below the wordmark, there is the following lettering: “Connecting Aspirations.” The shade of blue used in the Tata Motors logo is bright and saturated. Some of the concepts associated with the color include excellence, reliability, and strength. The brand identity was created in collaboration with an external agency. The new brand promise, “Connecting Aspirations,” is supposed to imply that the company is a system of mobility solutions that are intelligent and perceptive.